Because textbooks are supposed to last for a while so many students can use them, teachers sometimes require students to use book covers on their textbooks. Durable fabric book covers are sold in many school supply stores, but they are often expensive. 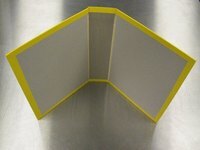 Homemade paper book covers are an option, but they are usually not durable enough. Because of this, homemade cardboard book covers are the perfect solution. Cardboard book covers are easy enough for any child to make for himself, too. Cut out a piece of cardboard that is 12 inches wider than the opened book and 5 inches taller than the book. Fold both longer edges of the cardboard over 2 inches and crease the fold. Fold each of the shorter edges over 5 inches and crease. Measure the width of the spine of the book. Draw two parallel lines directly down the center of the book cover that are far enough apart to accommodate the spine. For instance, if the spine of the book is 3 inches wide, the two parallel lines down the center of the book cover should be 3 inches apart. Fold and crease the cardboard at each of the pencil lines representing the spine. Slip the book into the folded 5-inch side sleeves of the cover.